Most financial consumers think of "the bank" as a place to keep liquid financial resources, such as money in checking accounts or savings accounts. But there are multiple different types of banks, and depending on the type, they offer different financial services. Many consumers will have a personal checking and/or savings accounts at a commercial bank. The commercial bank's primary business involves taking in financial assets such as deposits and then lending these assets to other customers at a rate of interest. These banks make money by lending the money at a higher interest rate than the interest rate they pay to deposit account holders. They also make money through fees charged to individual accounts. The interest rate the bank charges on loans and revolving lines of credit (or other types of credit facilities) will depend on the current interest rate environment. A consumer bank, such as a credit union or savings bank, may focus on the personal banking needs of a specific group or industry. The idea behind these banks is that by doing business with them, you're supporting that specific group or industry. Credit unions offer many of the same services that commercial banks offer, including checking accounts, savings accounts, mortgages and other loans, and credit cards. Private banks, meanwhile, cater to the needs of high net worth individuals and their businesses, which differ from the needs of most consumers. Private bank clients must usually prove a certain minimum net worth to obtain private banking services. Private bank services include tax and estate planning, tax planning, and philanthropic gift planning. Investment banks can work with businesses to sell bonds, which are basically loans to a business from investors at a specific rate of interest. The investment bank is the "middle man," distributing the bond issue to customers and otherwise facilitating the transaction. The investment bank may choose to distribute publicly traded bonds to clients or to arrange a private placement of the client company's debt directly with another company. The bank prices the debt according to the current interest rate yield curve and the company's credit rating. When a company has a higher credit rating, it needs to pay less to sell bonds in the public or private markets. Investment banks also raise capital for client companies by arranging equity issues, which are commonly known as stock. 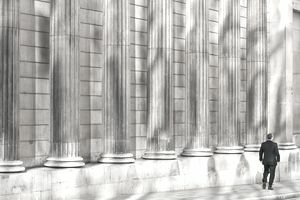 Investment banks receive fees from clients to raise capital, and many investment banks employ professional sales and marketing teams to distribute clients' debt and equity issues. Finally, investment banks help clients to restructure debt loans. In some instances, the bank creates new investment strategies or uses a client's other financial assets as collateral for debts. Investment banks also may use what are called derivative instruments — which include options, futures, and swaps — to help clients achieve their financial goals. Consumers use banks to keep their financial resources safe and readily available for use. Deposits made by customers of the bank are insured by the Federal Deposit Insurance Corporation (FDIC). Customers of the bank rely on its ability to pay them their financial resources that are held on account at the bank when they request the bank to do so. Banks allow customers to pay their financial obligation by writing a check on the bank account. The banks involved then handle the transaction, facilitating the transfer of funds to the payee. Banks also provide debit cards to customers, which allow you to access your funds without having to write a check or make a cash withdrawal. Debit cards also enable you to withdraw cash at the bank's automatic teller machine. There are various types of loans available to individual consumers from banks. For example, customers can obtain overdraft protection with the bank. In most cases, if a customer withdraws more money than is in the account, the bank charges that customer a fee. But overdraft protection, which usually comes in the form of a loan that's accessed when the customer overdraws the account, can protect against those fees. Banks also lend money to private and business customers. These loans take the form of personal loans, commercial/business loans, and home/property loans (mortgages). And, banks issue credit cards to customers. A credit card is another form of loan available to the consumer. The bank also supports its credit card business by charging fees for processing payments to settle customer credit card bills. To support merchants accepting customers’ credit cards, banks may offer a merchant network service. Merchant network services include card terminals or credit card machines. Banks facilitate fund transfers for customers via wire transfer and electronic transfer of funds. Banks utilize an interbank network to transfer funds to clients. Banks also provide certified or cashiers’ checks for customers. The bank guarantees the check so that the customer may offer it as certified available funds to a payee. To create a certified check, the bank usually withdraws client funds. Finally, banks offer the services of a notary public to validate clients’ important documents.